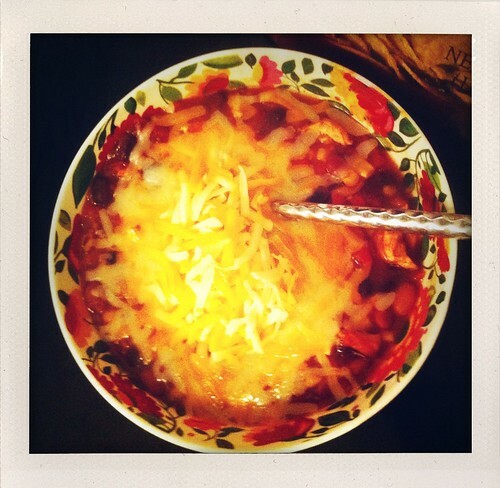 i dont know if ive ever written about taco soup on the blog, but if not- it’s high time! this is my all time favorite slow cooker recipe. i make it at least once every two weeks when its cold outside. its sort of a cross between chili and soup. it makes a huge batch so we can eat it for days, or freeze it for later. its cheap and easy…just the way i like my recipes! this is the perfect fall recipe! have i convinced you to try this yet!? Place the onion, chili beans, black beans, corn, tomato sauce, beer, and diced tomatoes in a slow cooker.Shred Rotisserie Chicken and add to pot. Add taco seasoning .Set slow cooker for low heat, cover, and cook for 5 hours. Note- Use whatever veggies you like! If you don’t like black beans, substitute another can of chili beans or whatever. If you don’t like the onions leave them out. As long as you keep the basic ingredients the same, you can swap out the veggies. sometimes i add in black eyed peas or okra. improvise! Since you are using pre-cooked chicken, it just needs to get hot, and give the flavors time to melt together. Theres nothing raw to be cooked, so once it warms up, if it tastes good, eat it! the longer you let it cooker, the better it tastes though…and it’s great the second day, too! ps- i was laughing because that picture looks like a bowl of cheese, but there’s soup in there, i promise! i just really like cheese. God bless you for sharing a crockpot recipe! I’ve been struggling with finding good ones.